Mark Bell of the excellent Film Threat wrote this review of Justin Hannah's short film "Consignment." 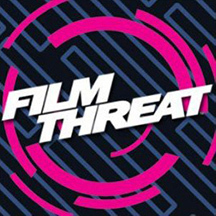 Founded in 1985, Film Threat Magazine (and since 1997, FilmThreat.com) has been a primary source for conversation about independent and underground cinema. A young woman, Margaret (Abbra Smallwood), hopes for the return of her love. To soothe her sadness, she goes shopping, eventually spying a strange, small box. The Shopkeeper (Margaret Wuertz) both warns and beckons when she explains that the box is a “love box,” that also holds a curse for discarded hearts (and is just the right size for a ring). As Margaret inspects the box, we’re transported to another place, where we see the story of another couple (Jake Gilliam and Jessica McGill) play out in all its tragedy. Looking like a cross between a Hitchcock thriller and an episode of The Twilight Zone, Consignment evokes a nostalgic mood while remaining puzzling. Exactly what happens when Margaret inspects the “love box” is not entirely clear. Is she seeing the life of the previous owners? Is she seeing the story of the box’s curse? Is she seeing her own story? Thus interpretation is left to the audience, and I think you’ve got your work cut out for you in figuring this one out. Considering the change in Margaret’s mood, and indeed the perspective on her life that we’re suddenly given anew by the final scenes, it’s hard to know what to trust. Is the truth what we’ve seen on screen, our own impressions, or something else? The idea of consignment is clearly an important enough one that the film feels the need to give a definition of it early on, so was Margaret living out someone else’s life, of vice versa? Was the “love box” always hers to begin with? Am I focusing on the wrong thing? On the filmmaking side of things, the stylistic choice of black and white, and dress, sets the tone for a story borne of years past. Coupled with the ambiguity of the narrative, the experience feels like a classic thriller, even as it likewise feels mostly harmless. The score lends itself perfectly to the proper vibe, buoying up the experience. The sequences involving the “love box’s” potential history (or whatever) seem to float in a timeless ether; the lack of color makes it all seem to exist in and out of space. Haunting in its use of negative space. In the end, you’ve got one confusing narrative that’s made all the more challenging by the fact that you thought you had a clue early on. It’s a brain teaser you may or may not want to take on, but the experience is a quality one even if you walk away scratching your head. Nothing wrong with being challenged by a narrative.